Original to the UK when first introduced by Atlantic Shopping, the Padded Crescent Bar Stool White is an exclusive. An amalgamation of both modern and retro design trends, the beautifully styled Padded Crescent is ideal for use in any type of environment, be that a 70s themed kitchen, or a minimalist breakfast bar. With a high arching backrest, it is easy to see where the Padded Crescent gets its name from. As well as giving the stool a dynamic profile, it also provides excellent support and comfort even for long hours of use. This sumptuously padded backrest wraps around the seat, padded in like fashion and covered in soft white faux leather, the white bringing a feel of freshness and airiness, with class and chic that transfers to the atmosphere. The seat sits on a slender chromed stem, on which is a hand fashioned footrest, crafted from chrome plated tubular steel. An adjustable height gas lift and 360 degree swivel mechanism give superb functionality, which with the sturdy circular base gives the Padded Crescent even more desirability. The base comes with a rubber ring beneath to help keep your floor free from scratches and makes this stool a well thought out choice. "Really happy with the look & comfort of them"
These Stools are beautiful. Really comfortable & look good at my breakfast bar. They were really well packaged & delivered quickly. Thank you Atlantic. Speedy delivery, easy to assemble, look great and very comfortable. Amazing service, price, product and delivery. Lovely comfortable stool and next day delivery. Very easy to assemble. Would recommend this company. Great quality, extremely comfortable and easy to assemble. I would not hesitate to recommend Atlantic to a friend - the postage was also quick. Very pleased with my purchase. 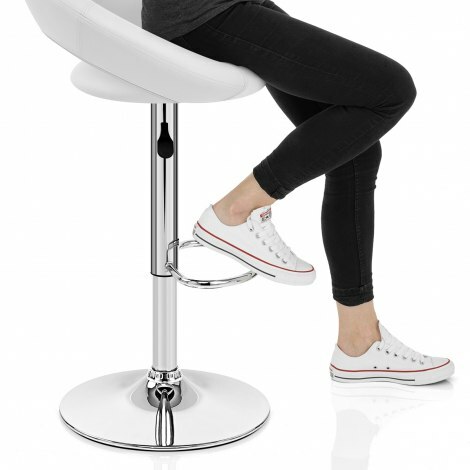 Love these bar stools, they are incredibly comfortable to sit in, they don’t scratch the floor when you move them. The service from Atlantic is fantastic too. Ordered them one afternoon they were there next day. Love them so much ordered the dining chairs to match.